Apple finally showed off its long-awaited iCloud service on Monday, portraying it as a service that stores content, wirelessly pushes it to devices, and integrates with applications —all at no cost to users. iCloud was demonstrated by Apple Chief Executive Steve Jobs, who even admitted that the previous MobileMe service was not Apple's "finest hour." But he also said that despite the company's previous mistakes, iCloud is a new product. "Today it is a real hassle and very frustrating to keep all your information and content up-to-date across all your devices," Jobs said. "iCloud keeps your important information and content up to date across all your devices. All of this happens automatically and wirelessly, and because its integrated into our apps you dont even need to think about itit all just works." The former MobileMe services —Contacts, Calendar and Mail —all completely re-architected and rewritten to work seamlessly with iCloud. Users can share calendars with friends and family, and the ad-free push Mail account is hosted at me.com. Your inbox and mailboxes are kept up-to-date across all your iOS devices and computers. iCloud Storage seamlessly stores all documents created using iCloud Storage APIs, and automatically pushes them to all your devices. When you change a document on any device, iCloud automatically pushes the changes to all your devices. 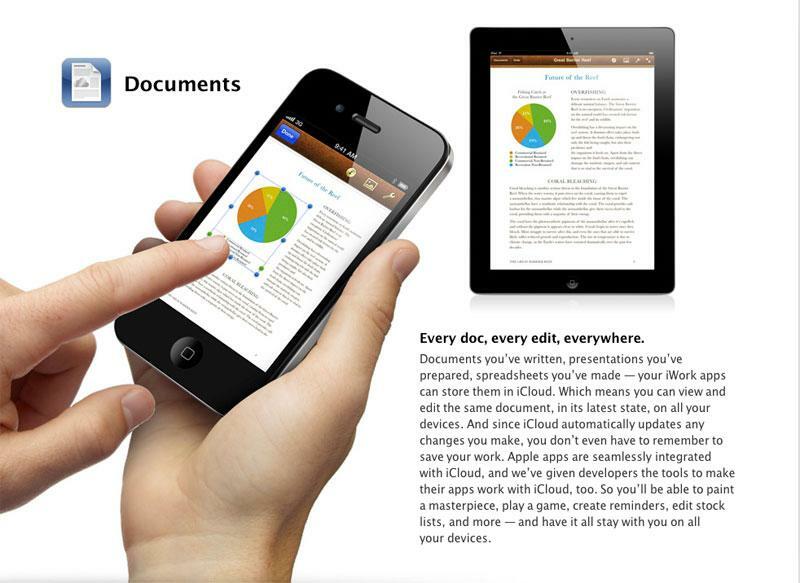 Apples Pages®, Numbers® and Keynote® apps already take advantage of iCloud Storage. Users get up to 5GB of free storage for their mail, documents and backupwhich is more amazing since the storage for music, apps and books purchased from Apple, and the storage required by Photo Stream doesnt count towards this 5GB total. Users will be able to buy even more storage, with details announced when iCloud ships this fall. iClouds Photo Stream service automatically uploads the photos you take or import on any of your devices and wirelessly pushes them to all your devices and computers. So you can use your iPhone to take a dozen photos of your friends during the afternoon baseball game, and they will be ready to share with the entire group on your iPad (or even Apple TV) when you return home. Photo Stream is built into the photo apps on all iOS devices, iPhoto on Macs, and saved to the Pictures folder on a PC. To save space, the last 1,000 photos are stored on each device so they can be viewed or moved to an album to save forever. Macs and PCs will store all photos from the Photo Stream, since they have more storage. iCloud will store each photo in the cloud for 30 days, which is plenty of time to connect your devices to iCloud and automatically download the latest photos from Photo Stream via Wi-Fi. iTunes in the Cloud lets you download your previously purchased iTunes music to all your iOS devices at no additional cost, and new music purchases can be downloaded automatically to all your devices. In addition, music not purchased from iTunes can gain the same benefits by using iTunes Match, a service that replaces your music with a 256 kbps AAC DRM-free version if it can be matched to the over 18 million songs in the iTunes Store, it makes the matched music available in minutes (instead of weeks to upload your entire music library), and uploads only the small percentage of unmatched music. iTunes Match will be available this fall for a $24.99 annual fee. Apple today is releasing a free beta version of iTunes in the Cloud, without iTunes Match, for iPhone, iPad and iPod touch users running iOS 4.3. iTunes in the Cloud will support all iPhones that iOS 5 supports this fall. Like MobileMe, iCloud will offer syncing of contacts, calendars and mail. It will also be an ad-free service, and will ship with all iOS 5 devices this fall. iCloud will come set up by default on new iOS 5 devices. Users will also be given 5GB of storage for mail, all free through the new service. iCloud will be integrated in the App Store on iOS devices, allowing users to see all of the applications they own, even if they are not installed on the current device. Devices can also be backed up to the cloud, for users who want to become truly PC-free. Content will be backed up to the cloud every day, and users will identify their account with a username and password login on any device. 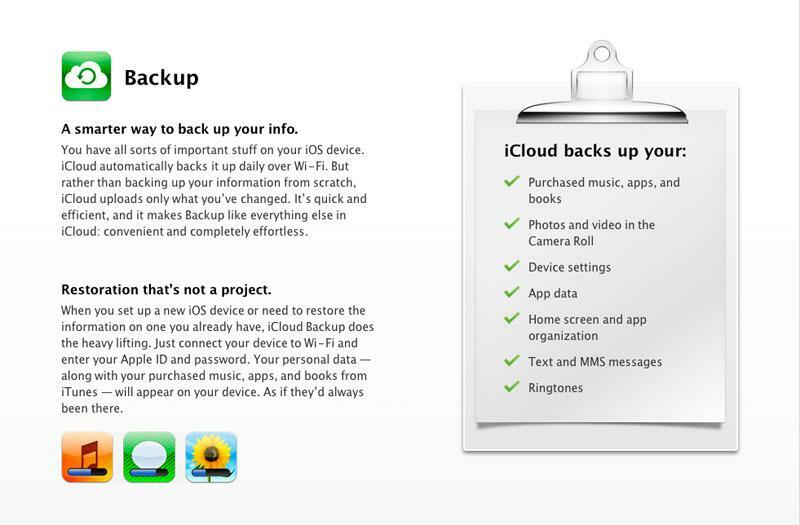 Backups will occur over Wi-Fi only, and will apply to a number of applications on iOS devices, including purchased music, books and applications; photos and video stored in the camera roll; device settings; and app data. A new feature called Documents in the Cloud automatically backs up documents created in Pages, Numbers or Keynote in the iCloud service. The newly released versions of the iWork suite for iOS already have this feature built in. Developers will also have access to iCloud application programming interfaces for their software. Applications will be allowed to store full documents, and they will be pushed to a user's device automatically. It will work across all iOS devices, as well as Macs and PCs. 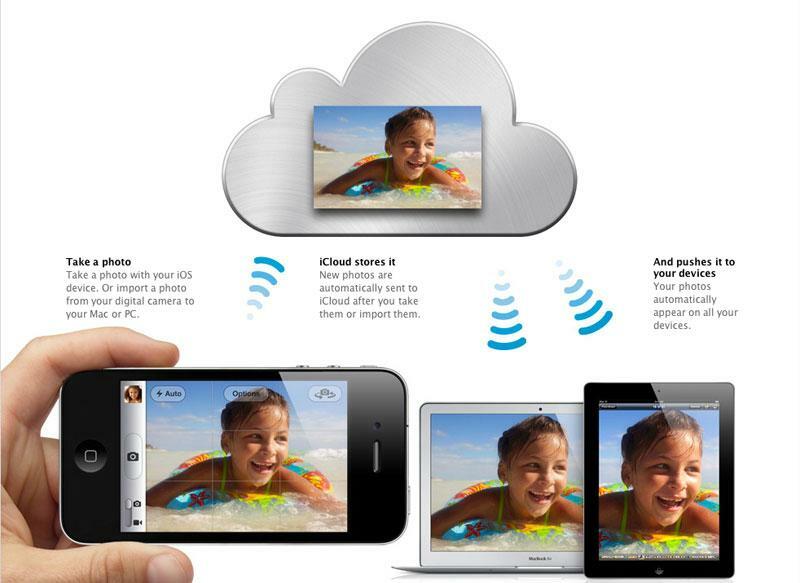 Photo Stream will also bring the cloud to photos, allowing users to back up and sync pictures automatically. With the new service, photos will be available to access on any device. On iOS, this will be accomplished right within the Photos application. To save memory, the last 1,000 photos will be stored on iOS devices, while in the cloud, photos will be saved for 30 days. Users can choose to keep a photo permanently by moving it into an album. 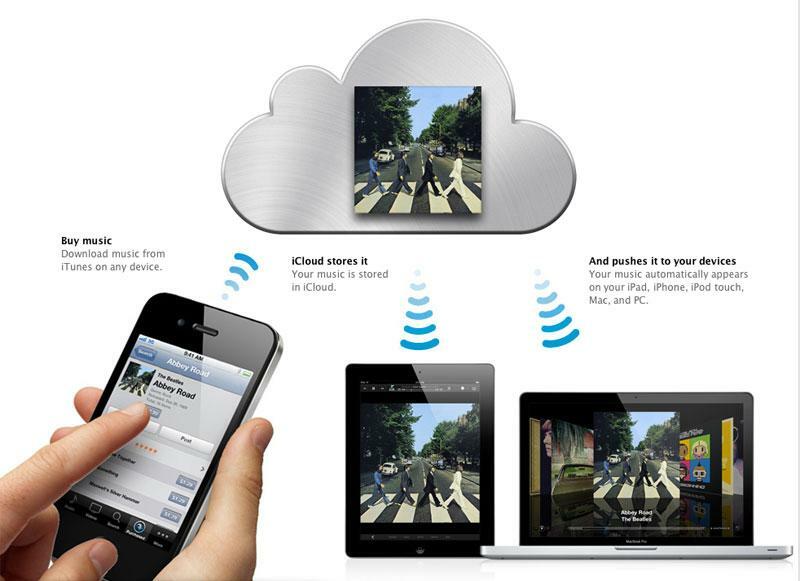 With iTunes in the cloud, users will also be able to redownload songs to any device at no additional cost. Just as with applications on the App Store, content that is already owned will be represented with an iCloud icon. A new setting in iOS will also allow automatic downloads of content on other devices. A new tab for purchased items will reside in the iTunes application. Songs are AAC files at 256Kbps and can be pushed to up to 10 devices.